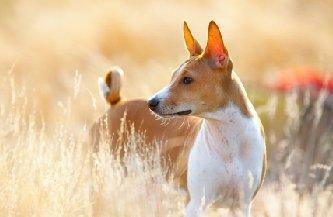 The Basenji isn't your typical dog breed. If you want a lap dog to fetch your slippers and play catch, then get a Toy Poodle. On the other hand, if you can appreciate a dog that'll chew those slippers to shreds, deflate the ball and happily present you with the evidence of his handiwork, then you just might suit a Basenji's idea of the perfect companion. Basenjis are considered one of the oldest dog breeds and their origin can be traced back to the height of ancient Egyptian civilization. The breed almost became extinct with the fall of Egypt itself, but a small population was preserved in the heart of Africa where it developed into a highly skilled hunting breed. Early attempts to import the breed to England and America largely failed due to bouts of distemper, but eventually a viable breeding pair was brought together in Boston and the Basenji began to gain a foothold with the American public. This breed is on the small side, typically standing about seventeen inches tall and weighing around twenty-four pounds. These dogs are short-backed and slightly taller on leg, with tails held tightly curled over the rear. The overall picture is that of a lean but muscular canine who can move with speed, grace and agility. Heads taper to a medium length muzzle and the ears are held erect. The forehead is covered in a series of wrinkles that can give these dogs quite a range of expression. Very little grooming is required. These are extremely intelligent little dogs, but they definitely have their own agenda. Their personalities are said to be more like cats than dogs, and while they are affectionate toward their people, they live to serve no man. Devotees find this quality one of the breed's strongest attractions. Here we come to the heart of the matter. These dogs are inherently different from other breeds. Their extremely independent nature makes them fascinating creatures, but not very obedient ones. These dogs are poor candidates for obedience training and they are not easily housebroken. In fact, they present about twice the challenge to adequately train as a Jack Russell Terrier does, and anyone who owns a JRT will tell you they aren't a breed for a novice dog owner. All said there is an irresistible charm about these dogs that draws adventurous dog lovers to them like moths to the proverbial flame. Proud owners will actually compare notes on the amount of damage and destruction their pets have racked up. The simple fact is your Basenji is far more likely to train you to put up with his eccentric behavior than you are to train him away from it. The breed is largely known for the fact that it doesn't bark, or at least not in the usual sense. This in no way means the breed is a silent one, and most individuals are capable of making a strange sort of yodel that is unique to the breed. Responsible breeders make every effort to screen affected dogs out of their breeding programs, and most offer a replacement guarantee in the event a puppy develops one of these disorders later on. So, now that you've had an introduction to the little powerhouse that is the Basenji, what do you think? Are you ready to consider a completely different dog breed, or are you genuinely intrigued by the Basenji's peculiar character? If you still find you'd like to get to know the breed better, there's probably a Basenji willing to take you on.